What’s it like to be a member of a recycling bin crew? When most of us are still tucked up in our cosy beds and not even contemplating getting up, the recycling crew for Lewisham are up and about getting ready for work, some as early as the disagreeable time of 4am. Clocking on at 6, the trucks are checked over, crews are kitted up with safety gear and the ten teams of recycling crews set off to all parts of the borough by 7. I don’t know about you, but I’ve only just got out of bed by then! Getting up early for work is one thing, but what does it really take to be a member of that crew? I met up with them to find out what their job involves on an every day basis…. Over the course of a week their rounds take them all over the borough collecting recycling from well over a thousand households every day. That’s a lot of bins to attend to! I wanted to find out just how they did that? So, first up you’ve got the driver whose job it is to plot a course through the narrow streets, keep a look out and maintain a steady pace with the crew as well as keep an eye on pedestrians, cyclists and the traffic who are all the time anxious to whizz around them. Then, on rotation, the other four guys are split in two, one pair running ahead of the truck pulling out the recycling bins and grouping them together so that the two guys at the back of the truck can easily grab the bins for loading. Not only are they running up and down our streets pulling out and loading bins while I’m still getting breakfast, they also do a quick visual check for anything that shouldn’t be in the recycling bins (or “contaminants” as they say in the trade). As the load is tipped in and before it gets compacted, the driver also inspects for contaminates that may have been hidden via a surveillance camera that he views within the cab. “We work pretty tightly as a team. We all look out for each other and try and help each other out” Oscar, the driver comments. “We’re like family really. And not just in our own crew but also when other crews need a hand we join them and help out with whatever they need. It’s a good group and we all try and help each other out” says Jerome, pitching in. “It was BAAAD! I didn’t think I’d make even 3 hours! I was totally stuffed!” Daniel replied shaking his head. And now they’re cranking up the fitness as the ability to recycle more items has now expanded. “People are definitely recycling more, because we can feel it in the weight of the bin when were pulling them out and you can see there’s more stuff in the bins too” they all agreed. Since the change in service which allows Lewisham’s residents to recycle much more there’s also been a significant drop in contamination – from about 14% down to under 5%. In fact the way Steve puts it, “Most of the time kerbside collections, like up in Blackheath, are clean as a whistle”. But in some areas contamination is still an issue. Crews are still finding food waste and other unsightly things in the recycling bins and continuously have to reject recycling bins that contain black sacks. In the UK black sacks have traditionally been used for rubbish not recycling, so crews cannot accept these when found in the recycling bin “We just can’t go around looking in each one to see if it’s recycling or not, apart from the fact that there’s no time to do that, it’s just not safe!” Steve adds. The crews really highlighted that especially on estate properties there are still many people who don’t seem to respect the recycling crew’s work, in that there’s lots of fly-tipping and contamination issues. Compared to kerbside properties, estates need to improve on recycling practices. So what did I discover about our recycling crews? If there’s one thing to take from this experience, it’s that these great guys, for all the banter throughout our chat, put in the hard yards and deal with something that most of us either take for granted or doesn’t even come across our radar. I can’t even imagine what it’d be like if these collections just stopped and we needed to deal with it! So thanks guys and all the other recycling men out there who contribute to such an important activity such as saving our natural resources! 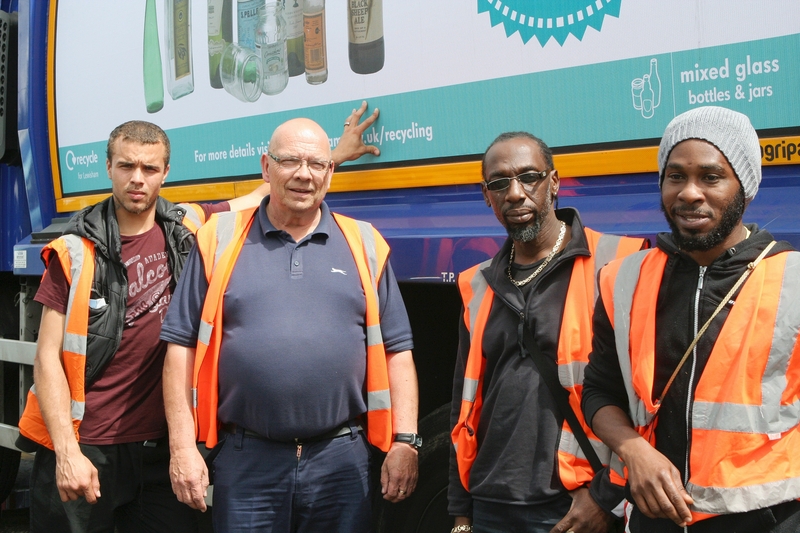 Categories: Reuse and Recycling Centre | Tags: collection crews, Interview with Lewisham recycling crew, Lewisham's recycling crews, recycling collection crews, Recycling crew, Recycling crews, refuse and recycling in Lewisham | Permalink.